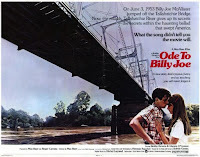 It always kind of bugged me that Bobbie Gentry never said what the "Ode to Billy Joe" narrator was throwing off that darn bridge, and I was never buying in to the idea that it was their baby (because -- UGH!) or a rag doll symbolizing the end of childhood (because -- whaaa?). I was less interested in why Billy Joe committed suicide (in the movie it was because he had a gay experience...again, whaaa? ), and more interested in what the heck got tossed off the bridge. This page does a very academic analysis of the song itself and shares some reader thoughts on what was thrown. Pass the biscuits, please.